Orissa’s premier daily newspaper ‘The Samaja’ is in severe danger as its suspected hijackers have been using tricks to project themselves as its genuine owners. Netaji Subhas Chandra Bose is being made the medium of their latest trick. January 23 is the birthday of Netaji. Cuttack was not only his birthplace, but also was his character-setter. That he emerged as an epitome of militant patriotism in Gandhi’s India is only because he had spent his first fifteen years in Cuttack under the influence of the Barabati Fort beaming rays of valor that the people of Orissa personify. The first fifteen years are most crucial in the formation and stabilization of human character. On and from the sixteenth year, man’s character doesn’t usually change. So, Kautilya Chanakya had opined that the day a son enters the sixteenth year in age; the father should treat him as a friend; because he would no further change in character thereafter. “Praptesu sodasa varse putram mitramibacharet”, he had said. And Subhas Chandra was the only one amongst the sons of Janakinath Bose to have lived his first fifteen years in Cuttack. The history of Orissa’s valiant battle against the Muslim, even when Bengal had surrendered to them, was putting its heroic impact on Subhas. The Muslims, by then having established their empire all over India including Bengal were facing the greatest obstacle to grab the whole soil because of the matchless militant patriotism of the people of Orissa. In describing the defeat that the Muslim Army had been thrown into in its aggression against Orissa, the Muslim historian Minhaj-i-Siraj, who himself was a part of the Muslim Army in that war, had noted, “A greater disaster had not till then befallen the Muslims in any part of Hindustan” (The history of Bengal, Muslim period: Dr. K. R. Quanungo, 1973, pp.48-52). Long thereafter, when the British grabbed India, the same valiant patriotism of the people of Orissa had also overwhelmed the foreigners in the first ever battle for freedom in the soil of India. In ‘A sketch of the history of Orissa’, the British historian G. Toynbee has described this encounter in the following words: “It was not long, however, before we had to encounter a storm which burst with so sudden fury as to threaten our expulsion”. In reporting this first freedom struggle of India, Magistrate W. Forrester had, on 9.9.1818, told Commissioner Robert Ker, “the nature of the country (Orissa) and disposition of the inhabitants (the Oriyas) will always present formidable obstacle to the suppression of these disturbances either by military or police”. So, Subhas Bose was shaped by Orissa in the climate of militant patriotism that her children epitomize. Its reflection was seen when he assaulted Prof. Oaten for his anti-India utterances that led to his expulsion from the Presidency College, Calcutta, where he was pursuing his studies after matriculation from the Ravenshaw Collegiate School, Cuttack. Therefore, for the people of Orissa, Netaji Subhas, being the creation of their militant patriotism, is the object of their patriotic pride. Come January 23, every patriotic Oriya feels pleased to celebrate his birthday. The suspected hijackers of The Samaja are trying to exploit this emotional attachment of the Oriyas for Netaji this January 23. The trap is very shrewdly laid; but appears very innocent. Student leaders are being organized to attend State level conference at Cuttack to accept felicitations on the occasion of Netaji’s birthday. The trap is designed to start with garlanding the statue of Netaji in the College Square from where a rally dedicated to Netaji would proceed for its destination at Gopabandhu Bhavan, presently under occupation of the suspected hijackers of the Samaja, where they would hear orations by a select group of persons on relevance of Netaji. But these orators do not know that they would be used as mere masks as the suspected hijackers of The Samaja are eager to hide their ugly faces behind those masks. To understand the phenomenon, we are to see how The Samaja has been hijacked and why the beneficiaries of this nasty offense are eager to hide behind the masks. The Samaja was founded by Utkalmani Pandit Gopabandhu Das with the monetary help given by the people of Orissa. When alive, he was next only to Utkal Gourav Madhusudan Das in stature as a leader of the land. But, despite that, he had failed to extricate himself from the circle of a syndicate of caste supremacists, who, because of greed, had an eye on his prize property that included the Samaja and its publishing house, the Satyavadi Press. After Gopabandhu’s sad death – his employee Radhanath Rath on whom he was situationally depending had tortured him into the pathetic premature death – that syndicate seized the Samaja by suppressing his real Will and using a forged one created by the same Radhanath and Lingaraj Mishra. And, thereafter it was seen that active members of the syndicate, under the cover of SoPS became reigning deities in the Samaja set up and rose in political stature by usurping the tremendous popularity of the late leader, Pandit Gopabandhu. Since then the people had a belief that Gopabandhu had given away the Samaja and Satyavadi Press to the SoPS by his last WILL. Only a few months ago we stumbled upon a document that gave birth to a suspicion that Gopabandhu had NOT given away the Samaja and Satyavadi Press to the SoPS by way of a WILL before breathing his last. The WILL that formed the base of ownership of SoPS over the Samaja was apparently a fake WILL. As the exposure was made in these pages, admirers of Gopabandhu immediately jerked into action and wanted the SoPS to clarify its position in view of the exposure. Instead of displaying in public the WILL of Gopabandhu, if any, in original, so as to undo the shock of the exposure, the SoPS indulged in such shenanigans that the suspicion became more defined. The admirers of Gopabandhu formed a forum called “Save the Samaja Forum” that in a press conference called upon the SoPS authorities to remove the suspicion by producing the original WILL, if any, in public. If the Will of Gopabandhu was forged as suspected, the hijackers of the Samaja have swindled away hundereds of crores of rupees from the Samaja income, which belongs to Orissa, the Forum alleged. The SoPS, instead of clarifying its position vis-à-vis the raised doubt, forced the editor of the Samaja to blackout the press conference of the Forum and, on the other hand, to use news space to denigrate the Forum leadership. At this stage it transpired that, the SoPS has also been hijacked by a pack of tainted members, who were facing disciplinary action on charges of corruption and embezzlement of the funds of the Samaja. These tainted members have contrived the trick to use the speakers who would address the January 23 event as well as Netaji Subhas as masks in their attempt to appear as genuine. When the names of Manubhai Patel, Rajkumar , Deepak Malaviya, Bhimsen Yadav, Prasannavadan Mehta, and Niranjan Rath appear in the program sheet – spread by one Pravas Acharya posing as Secretary of SoPS (Cuttack) – as President, Vice-President, Secretary, Treasurer, Exe. member and Exe. Member of SoPS respectively, records show that none of them has yet established the legitimacy of occupation of such positions in the Court that is hearing the allegations against them as well as in the police stations where cases against them have been registered. On the other hand, as confirmed member of SoPS, they are bound by its constitution “to lead a pure personal life”. Let us look at each of them against the backdrop of this requirement. He was found to be a man of dubious character by the then President of SoPS and editor of the Samaja, late Radhanath Rath. In his letter dated 3/2/1985 to Sevakramji, Rath had noted that despite “repeated requests” he was not refunding the “huge money” that he had taken “from the Orissa branch for his election expenses”. Describing the conduct of Manubhai as “very unfortunate”, Rath in the same letter expressed strong disliking for “his character” while saying that he was being “blamed for him in Orissa”. 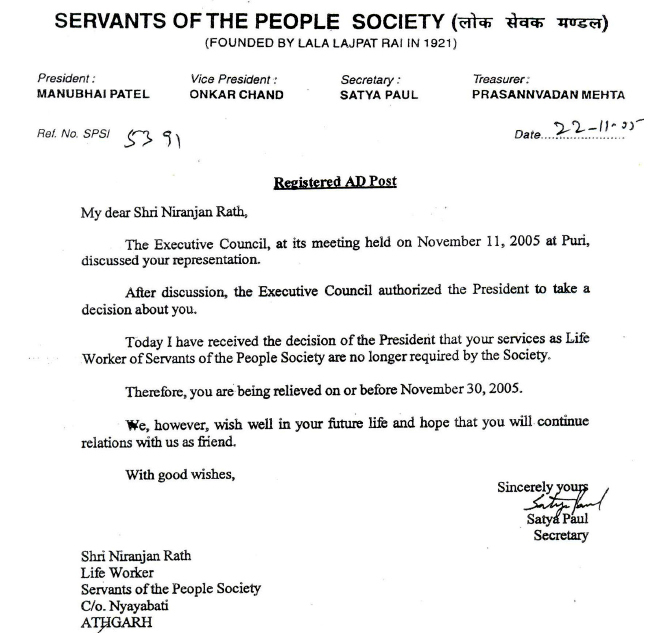 Patel was held guilty of misuse of his position and was removed from the post of President of SoPS in an extraordinary meeting on 9/6/2011 by all but one members of the General Body that elected Onkar Chand as the President in his place. Reacting to allegations of criminal offenses for which prosecution against Manubhai was sought for in a case before the Orissa High Court, the GB had held that much damage had already been done to the reputation and image of SoPS by his wrongful activities. He is charge-sheeted vide 2012/SP02/July 5, 2012 for having manipulated minutes and records of the society to fulfill his selfish purpose. Being confirmed as a life member of SoPS on 1/4/1992, his membership has expired on 31/3/2012. Thereafter he is alleged to have illegally overstayed as a life member and a functionary through manipulations and in blatant disregard to the stipulations laid down in the Society’s constitution. He is charge-sheeted under SoPS letter dated 27/6/2010 for “serious misconduct” discernible in “manipulation of minutes/documents of meetings … on different occasions” and for sanction of “Rs.20 lakhs to the GIMSAR without due authority”. He is also charge-sheeted under identical orders for offenses similar to that committed by Malaviya. Allegations of massive misappropriation of funds, financial loss caused to SoPS by manipulation of accounts of a farm situated at Panipat comprising over 144 Acres of land placed under his care, manipulation of records to sell away 11 Acres of the Panipat land with ulterior motive etc are also placed before the Officer-in-charge of Economic Offenses Wing of Haryana Police as well as in the Panipat Police Station, on July 13, 2012. He is a co-accused in the criminal case lodged by Sourav Sahu for “misappropriation of funds from the account of ‘The Samaja’ by means of fraud, forgery and cheating”. And the matter is pending since April 2011. It is noteworthy that the employees of the Samaja, in their Association letter No. 41/GS/10 dated 24/1/2011, have also raised serious allegations against Mehta in the matter of purchase of newsprint, exposing him as vested interest with his son as an agent of a newsprint dealer . ‘The Samaja’ being a highly heavy consumer of newsprint as Orissa’s top circulated multi-editional daily with many sister publications, the transaction is worth several hundred crores of Rupees. And, choice of the supplier of newsprint gets done through corrupt practices, a chunk of which had made Justice Arijit Pasayat committee, appointed to enquire into corrupt practices in management of the Samaja, suggest specific action against member Niranjan Rath and GM Hemanta Sahu. The employees had alleged that Mehta was supporting Sahu because of a secret deal with him in his son’s context. As Manubhai Patel was then the President of SoPS and he was addressed to the allegation against Mehta, the nexus between them both, had given a snubbing to the employees allegation. But the allegation still stands. To me personally it is paining to write about him, he being a dear personal friend for many decades since my days in Athgarh. At that time I believed that he was a crusader against corruption. But under the climatic impact of SoPS, he has perhaps degenerated into a condition where corruption finds it easier to inscribe its signature. He was charged for theft of money by a reputed colleague, Journalist Prados Pattanayak, who has retired from the Samaja on superannuation in the post of news editor. Pattanayak’s allegation has been registered as a cognizable offense u/s 380 IPC generating case No. 15/03 on 12.3.2003. The Executive Council of SoPS had had a discussion on him in its meeting at Puri held on 11/11/2005, consequent upon which he was terminated as a life worker on 22/11/2005. How and why and by whom under what circumstances he was recruited again and got confirmed as a life member is a mystery. But the Committee of Inquiry headed by Justice Arijit Pasayat has found him guilty of moral turpitude at least in two counts. The Report of this committee was “unanimously accepted” by the Executive Council of SoPS in its meeting on 28/2/2011 at Baroda. In this report, the Enquiry Committee has observed in the context of Niranjan, that, “a life member (of SoPS) is mandated to maintain pure personal life, but if any member is of objectionable character and reputation, it is against the interest of the society; and therefore, his life-membership has to be terminated”. Such is “pure personal life” in the parlance of SoPS that these fellows are projecting themselves as functionaries thereof as indicated supra! The Constitution of SoPS doesn’t bear any provision for a post that he has brandished in the program card he has circulated. Before becoming even a worker, Acharya was using the name of SoPS even though he was not entitled to do so. Therefore, on 2/2/2010 he was warned by the President of SoPS. “Please do not use the name of Lok Sevak Mandal (which is SoPS) till you are accepted as a life worker”, Sri Manubhai Patel, as the President of SoPS, had warned him. 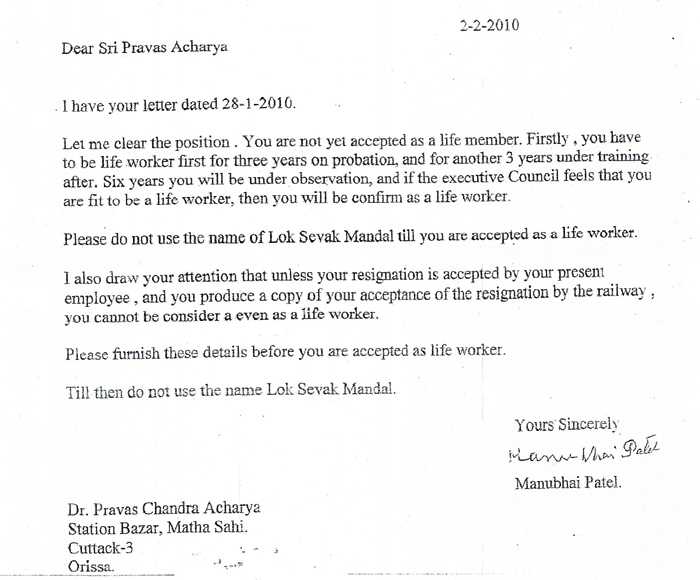 Patel had made it clear that, in order to become a member, Acharya was to work as a life worker first for three years on probation, and another three years under training. After six years, he was to be put under observation, and if the Executive Council feels that he was fit to be a life worker, then he was to earn confirmation as a life worker before being considered for elevation to rank of life member. “Till then do not use the name of Lok Sevak Mandal” he had warned Acharya again. Obviously, Acharya was illegally using the name of SoPS even without being a worker, which had provoked Patel to issue him the warning while refusing him ready entry into the society. So, the self projection of Acharya as the secretary of SoPS, Cuttack with display of the names of Manubhai Patel, Rajkumar , Deepak Malaviya, Bhimsen Yadav, Prasannavadan Mehta, and Niranjan Rath in the invitation for the convention on January 23 indicates that he is now the front man of the gang of six who want to use Netaji as their mask to hoodwink the people of Orissa in the matter of hijacking ‘The Samaja’. Sad, some respected persons like Smt. Tulasi Munda, Baijayant Panda, Pradyumna Satpathy, Nrusingh Kar, Prasad Harichandan, Chittaranjan Mohanty, Akshyaya Das, Dr.Purnachandra Mohapatra, and Prof. Suryanarayan Mishra have fallen in their trap to make people be misled to accept these hijackers of the Samaja as genuine owners thereof. But should they continue in their trap? EXCELLENT ARTICLE SUBHAS BABU EXPOSING THE ALLEGED HIJACKERS OF SAMAJA AND GOPABANDHU BHAVAN BY COMMITTING FRAUD. I THINK NOW THE MANAGEMENT OF SAMAJA SHOULD COME FORWARD TO COUNTER YOUR CHARGES THROUGH DOCUMENTARY EVIDENCES. Let me bring two important events glaringly elaborated by Subhas Chandra Pattanayk in his article in orissamatters.com. The person who is claiming to be the Printer-Publisher of the Samaja (Niranjan Rath) with this power will be presiding over the student leaders’ show in January 23, 2013 has been running out of two escalators of truth- the inquiry made by Servants of the People Society’s top functionaries and another is non other else than Dr. Justice Arijit Pasayat who happens to be life trustee of Servants of the People Society. 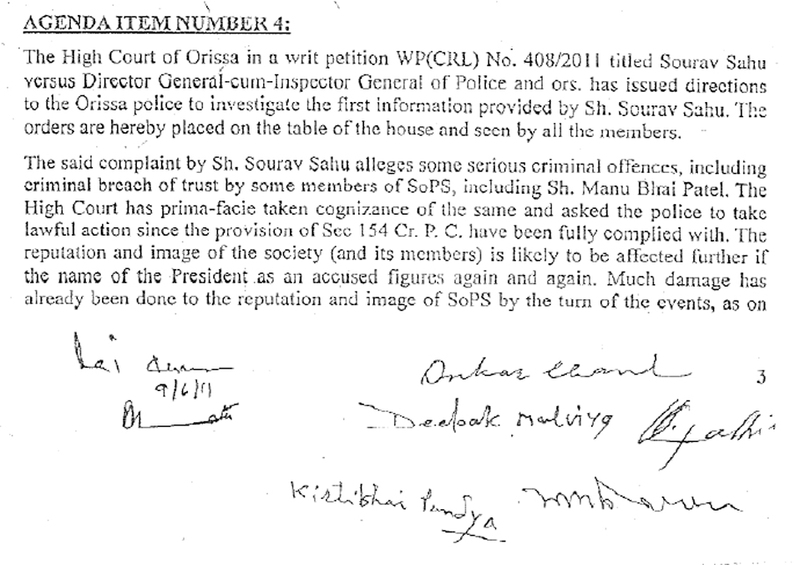 On basing upon the earlier inquiry Sri Rath was removed from the Life Worker post of the said Society in 2005. But subsequently Sri Rath entered to the Society as a Life Member with his ‘act of appeasement’ to the senior functionaries of the Society. Again he was caught by his own net of fishing by Justice Pasayat Committee report. This committee recommended to the Society to remove Sri Rath from the primary membership of the Society on record ” A Life Member is mandated to maintain pure personal life, but if any Member is of objectionable character and reputation, it is against the interest of the Society, and therefore his life-membership has to be terminated. But this Rath is made Printer-Publisher of the Samaja by a gang of occupiers and boastfully representing himself on behalf of Servants of the People Society. This person is also accused of serious criminal offenses under law by at least 5 FIRS by different police stations. How can the leaders of the future will be energized by a conference presided by a person whose conducts, approaches and services are under serious doubts and investigation? Let us come to the convener of this show, Mr. Pravas Acharya. A person, who had been trying for decades to get an entry into the Servants of People Society and used to fail. When a gang of occupiers hijacked the Society and the Samaja, then only Mr. Acharya could get a berth (Life Worker) for him with promises to help such gang to grab the property of Samaja and Society. Reports are flooding in media about this conspicuous design of that gang. Moreover Mr. Acharya was previously denied an entry into the Society by two of its presidents, Sri Manubhai Patel and Sri Onkar Chand. Not only that, the senior life member of the Society Prof. Kishor Chandra Tripathi in many executive meetings of the Society also had put his opinions against Mr. Acharya for which his candidature for life worker had been genuinely rejected. Present president of the Society Sri Onkar Chand in his letter on April 05, 2012 rejected Sri Acharya’s application on grounds that he has crossed the age limit and cited the documents basing upon which his earlier applications had also been rejected. Manubhai rejected his application for membership because he was in government service and serious doubts have been raised against his behavior and act by the then Editor of the Samaja Sri Sarat Mishra and Sri Khitish Chandra Mahapatra’s (x’advisor of Sri Manubhai Patel. Besides, his offenses against the then Director of Doordarshan, Bhubaneswar is also taken to the notices of public. Sri Acharya only offered (as told) his resignation from his service in Indian Railway when he was entitled for pension.If he is so interested in social services why didn’t he leave his job to join the society much earlier? How could such people address the future leaders of the State? Sethi people nka servant nahanti,particular persons nka slaves achhanti. And it has been proved so many times, time and again.